Jaki Shelton Green will be installed as the new North Carolina Poet Laureate on Monday, December 10, at 4:00 pm. The event takes place at the State Capitol, 1 East Edenton St., in Raleigh. Seating begins at 3:30 pm, and the program will start at 4:00 pm, with a reception to follow. Please note that the State Capitol will still be open to the public during the ceremony, so guests are encouraged to give themselves plenty of time to find parking, go through security, and register. Please enter the East Portico of the Capitol. North Carolina Arts Council staff will greet you and provide directions to the ceremony. Green is the first African American and the third woman to serve as the state’s ambassador for poetry and the spoken word. She will be installed during a public celebration later this summer. 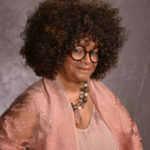 Green succeeds fellow North Carolina Literary Hall of Fame inductee Shelby Stephenson, who was named poet laureate February 2, 2015. A native of Orange County, Green has been active in North Carolina’s literary and teaching community for more than forty years. She has penned eight books of poetry, co-edited two poetry anthologies and written one play. She is a 2014 North Carolina Literary Hall of Fame inductee and was the recipient of the North Carolina Award for Literature in 2013. Green currently teaches Documentary Poetry at Duke University Center for Documentary Studies. She has taught poetry and facilitated creative writing classes at public libraries, universities and community colleges, public and private schools and with literary organizations across the U.S. This was written by charles. Posted on Monday, October 29, 2018, at 5:36 am. Filed under Uncategorized. Tagged Jaki Shelton Green, NC Arts Council, nc poet laureate, poetry, politics, Raleigh, Shelby Stephenson. Bookmark the permalink. Follow comments here with the RSS feed. Both comments and trackbacks are currently closed.